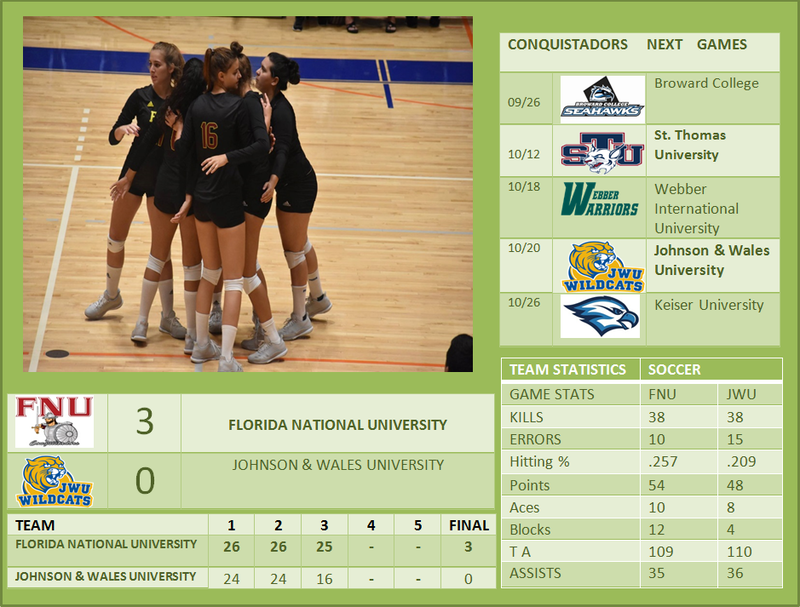 NORTH MIAMI, Fla. (Oct. 10, 2018) – The Florida National University Conquistadors women’s volleyball team defeat Johnson & Wales Wildcats volleyball team 3-0 in a tightly-contested 3-0 (26-24, 26-24, 25-16) on Wednesday evening, at the Wildcat Center. FINAL: W, 3-0 (26-24, 26-24, 25-16). RECORDS: Florida National University (13-11), Florida Memorial University (8-14). LOCATION: Wildcat Center | North Miami, Fla.
SET 1 |The match started with a back-and-forth set number one that saw seven lead change and 12 tied scores. The Wildcats hit .205 in the frame and were led by Ines Bawedin with four kills. However, four service errors by the Wild cats ultimately led to a 26-24 win and a 1-0 advantage for FNU. SET 2 | Set two pitted JWU’s .333 hitting percentage to the FNU Conquistador’s .343.The Conquistadors were led by Afraina Ammerlaan with 4 kills and finished the set with a Service ace by Ines Bawedin. FNU pulled out the 26-24 win to take a 2-0 lead. SET 3 | In set three, FNU hit .324 while JWU registered an attack percentage of .086. Twelve kills (with no hitting errors) and two team blocks resulted in a 25-16 win for the Conquistadors in set three. Ines Bawedin * and Afraina Ammerlaan  led the Conquistadors with 9 kills each. Camilla Kahlich had 8 kills while Maricielo Zuluaga had 7. Splitting time directing the offense, Carolina Dantas registered 31 assists and one server Ace. Wandy Cruz, Carolina Dantas and Ines Bawedin had 16, 13 and 8 Digs respectively. The Wildcats ended the night hitting .209 while FNU hit at a clip of .257. The Conquistadors held a 6.0-2.0 edge in total team blocks while the Wildcats held a 56-50 edge in total digs. The Conquistadors will have a home game and will face Broward College on Friday, October 12th, at 7:00 pm.